Why is apartment marketing in Google challenging? The search environment for apartment communities has changed in recent years. Apartment communities are contending with internet listing sites, algorithm updates and evolving search behavior. Overall apartment supply has increased in the nation’s top ten metros, and that means more communities are competing in the search engine for similar location based searches. Just take a look at these search results for “apartments in Chicago”. The entire page of search results is dominated by ILS sites. This is often the case for many city based apartment searches. The rise in ILSs in the search engine have made it difficult, if not impossible for many communities to organically rank on the first page of Google for non brand city or neighborhood based apartment searches. Another factor affecting organic search rankings are the updates Google made to their most recent algorithm, Hummingbird. In 2015, Google introduced Rankbrain to their Hummingbird algorithm. The new update improved Google’s ability to interpret the intent of a searcher’s query. Google now uses a range of signals (location, time of day, and device type, among others) to get a deeper understanding of the type of information a user is seeking from a query. This new algorithm also improved Google’s ability to identify related keywords and present search results for related phrases. If someone is located a few miles away from a community and searches on a mobile device, they will likely see different organic search results for the same query than someone who lives in a different state and searches at night. The former searcher is more likely to see local listing results and the latter may be more likely to see ILS sites. These changes have made it increasingly more difficult for communities to consistently show up in the search results for a given query using traditional SEO strategies. Another factor limiting organic traffic is the rise in mobile search behavior. Most apartment searches in Google take place on mobile devices. Mobile searchers see limited results and ads take up a sizable portion of these smaller screens. Google makes it more engaging for searchers to click on ads on mobile devices with ad extensions. In the example shown below searchers can click to call a community or click to view the community’s location. How do SEO and SEM strategies fit into this new search environment? A lot of traditional SEO tactics simply don’t work well in a 2019 search environment. Off-site SEO strategies for apartments have fallen out of favor in recent years because of Google’s new algorithm changes. SEO tactics like link building used to be a surefire way to increase your website’s authority in the eyes of Google, but now Google is smart enough to know what links are valuable, and what links are “bought”. On-site SEO strategies involving site structure, keywords, and pagespeed are still worth pursuing but not for all search terms. Most non brand location searches are so competitive that they aren’t worth trying to rank organically for. Onsite SEO strategies that help you rank at the top of the search engine for your community’s brand name and a few specific medium tail location based terms offer a more realistic approach to apartment SEO. So what should you do to improve SEO for your community? In most cases, ranking for your brand name is one of the easiest key terms to rank for (this is more difficult if your brand name includes a very popular keyword phrase). These are some of the more promising onsite SEO strategies communities can use to rank for their brand. Make sure your header tags, title tags, and meta description text includes your brand name. Keep your meta descriptions between 120-158 characters. Include your brand name in alt-image tags and header tags on your homepage where possible. Make sure your brand name exists in your website copy but try not to overuse the term to the point of keyword stuffing. The second easy and impactful step you should take when trying to rank organically is to make sure you have a Google My Business listing that is accurate and flattering. Try to generate positive Google Reviews from residents to give your community the best possible chance to succeed in this highly engaging search format. Finally, make sure your website is mobile responsive and loads quickly. Once you make these three SEO optimizations (onsite brand optimization, Google My Business listing, and fast responsive landing pages) there isn’t much more you can do to significantly ramp up organic search traffic for an apartment community. Apartment SEM strategies, unlike, apartment SEO strategies provide communities with more opportunities to grow search traffic and optimize visibility and engagement in the search engine. Remember the city search results we looked at earlier that populated a page full of ILS listings? Communities can overcome those listings using Google ads. Ads allow you to target location-based apartment searches for your city, zip code, and neighborhood that would otherwise be near to impossible to rank well for organically. In Google ads you can target people living in a specific radius around your community, you can target competing community’s brand searches, and you can expand your reach by targeting people outside of your state or country. Through day parting you can limit the time in the day your ads run and you can customize the ad copy you showcase when people search for specific keywords. Luxury, pet-friendly, penthouse, and affordable are all examples of adjectives that you can include in ad copy and in your target list of apartment keyword searches to generate more qualified search traffic. Google gives advertisers optimization strategies to help them improve their search performance. Communities can deploy strategies like max click bidding and maximize conversions to get Google to serve your ads to people more likely to take your desired action. Google also gives you more feedback in their advertising platform to help you generate better results. Consistent top of the search engine rankings, ad extensions and new expanded text ad formats increase the likelihood that your listing will generate engagement in the search engine. New expanded text ads give advertisers more headlines and description copy than previous ad formats. Advertisers aren’t just getting more room for headline and description copy. They also have the ability to use ad extensions to make their listings longer and more engaging. Ad extensions can showcase positive reviews, pricing or additional links known as site link extensions. For a more in depth look at the ad extensions that work best for apartment communities check out this blog post. Google rolled out a new ad format last year called Responsive Ads. These new ads use AI techniques to deliver a unique combination of headline and description copy to searchers based on their user behavior. Early trials of these ads show better engagement rates but higher CPCs. As Google’s AI gets smarter, these new ads will continue to become increasingly more engaging than traditional Google organic listings. After utilizing basic onsite SEO and GMB strategies, most communities won’t see much growth from large monthly investments in SEO. In today’s modern search environment communities are up against more direct competitors and ILSs. Communities stand to gain more from investing in SEM strategies that utilize the full spectrum of targeting, bidding optimization, and ad format opportunities that Google ads provide. 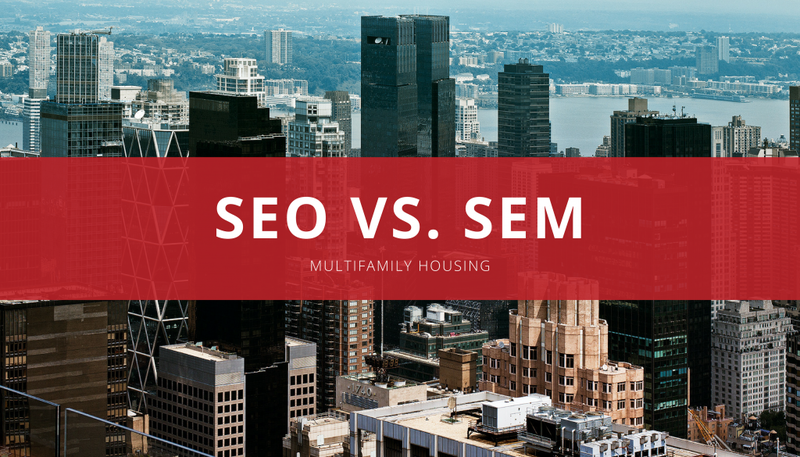 Did you walk away from this article with a better understanding of how SEO and SEM apartment search strategies differ? Consider passing this information along to a colleague using the social sharing buttons on this page.